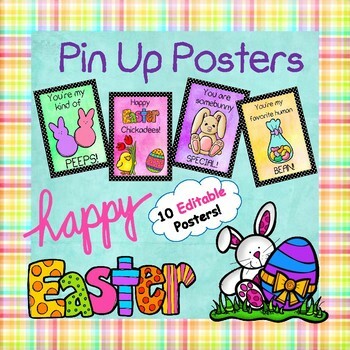 This set of super cute Easter posters will definitely add some fun and color to your classroom. This download is editable, and you will need to have PowerPoint to use it. I have also included a PDF version so if you don't have Powerpoint - no worries! 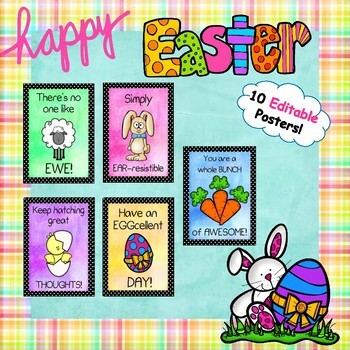 *10 editable Easter posters with a few fun Easter puns. You can edit these to make them say what ever you like. Use them as encouragement posters, station signs, or however you want. You can also choose whatever font, font color, and font size you want. *10 PDF version of the posters that are not editable (and do not require Powerpoint to use). If you like the messages and the font that I used, these are ready, set, print! 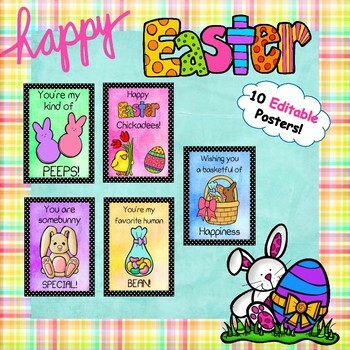 Just print them out and hang them up to bring some Easter cheer to your classroom!